If you haven’t yet read the Divine Comedy you know who you are—now is the time, because Robert and Jean Hollander have just completed a beautiful translation of the astonishing fourteenth-century poem. The Hollanders’ Inferno was published in 2000, their Purgatorio in 2003. Now their Paradiso is out. Jean Hollander, a poet, was in charge of the verse; Robert Hollander, her husband, oversaw its accuracy. 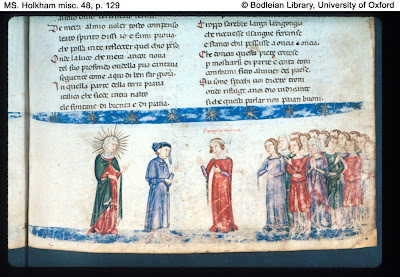 The notes are by Robert, who is a Dante scholar and a professor emeritus at Princeton, where he taught the Divine Comedy for forty-two years. The entire Comedy is an allegory, a symbolic representation of the highly systematized theology that St. Thomas Aquinas and other Scholastic philosophers distilled from the Bible, the Church Fathers, and Aristotle in the late Middle Ages. But in the Paradiso the allegory is far more naked than in the Inferno or the Purgatorio. In Dante’s time, and for a few centuries afterward, readers of poetry (learned people, mostly priests) were accustomed to allegory, and thought it was a good teaching tool, because it made you work. As Boccaccio said in his “Life of Dante” (1374), “Everything that is acquired with toil has more sweetness in it.” But since the early eighteenth century that is, since Europeans began questioning the faith that is Dante’s subject there has been a tradition of discussing the Comedy in terms of a “duality” between its allegory and its “poetry.” What is suggested here is that the allegory is anti-poetical, and that what is acquired with toil is mostly toil. The best-known modern statement of this position is a 1921 book, “The Poetry of Dante,” by the philosopher Benedetto Croce. The allegory that is so great a part of the Divine Comedy, Croce declares, is non-poesia, “not poetry,” and he makes fun of it.Croce’s book fell like a bomb on the Italian literary world Luigi Pirandello wrote a wrathful review of it and still today it is regarded by some as an irresponsible document. Where is Ein Hod? I will come visit on my next trip to Israel.